Sixty immigrants have been found in a load of ice-covered broccoli in a refrigerated trailer that was searched at a South Texas border checkpoint, federal officials said Monday. A U.S. Customs and Border Protection statement said nobody was hurt and the trucker was arrested at the Falfurrias checkpoint. Agents on Saturday opened the padlocked trailer and found dozens of immigrants amid pallets of broccoli lined with ice. 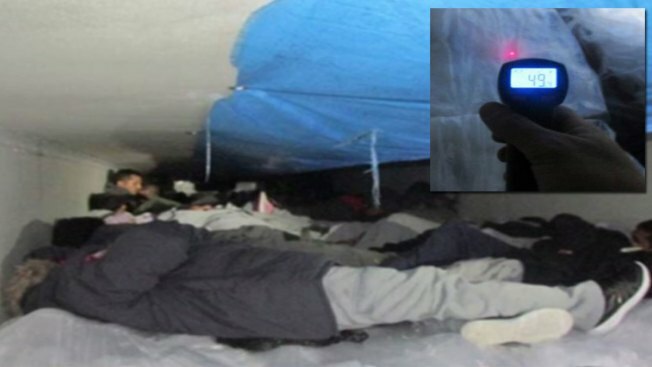 Customs officials say the temperature inside the trailer was 49 degrees. Some immigrants wore hooded heavy coats. The immigrants -- from Guatemala, Mexico, El Salvador and Hondurans -- were detained and being processed for entering the U.S. illegally. The trucker faces immigrant smuggling charges. Officials didn't immediately say where the produce was headed or provide further details on the investigation. Last week, Border Patrol agents found 16 immigrants locked inside a semitrailer at a gas station in the South Texas city of Edinburg and 20 immigrants crammed into a locked semitrailer at an Interstate 10 checkpoint southwest of El Paso. All were in good condition. Last month, 10 people entering the U.S. died after being packed with as many as 90 other people into a sweltering tractor-trailer that was found outside a San Antonio Walmart.